A new detector technology lets us more than double the resolution of our electron microscope, resolving features 0.4 Angstoms apart. With a record resolution well below the shortest bond length, finding a good test object was a challenge. Twisted bilayers of two-dimensional molybdenum sulfide gave us the world's smallest ruler - where the projected distance between atoms could be made arbitrarily small. Microscopists obsess over resolution. This one number has become the shorthand that describes the performance of a new instrument, even when we know better (brightness, cough cough). There is a long history of this. The plot below shows the improvement in diffraction-limited resolution over the past two centuries. It's not that much different from a similar plot a decade ago. 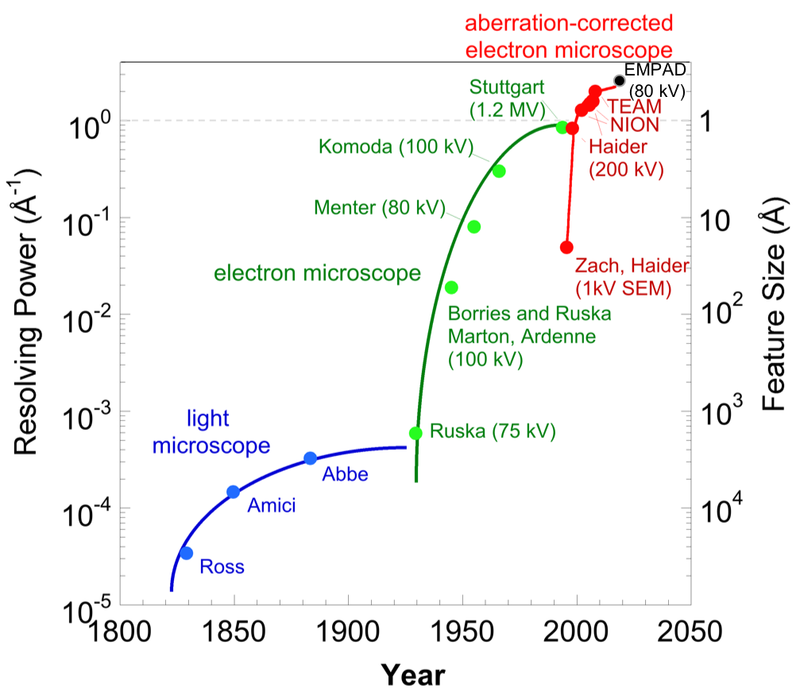 Optical microscopy reached its far-field diffraction limit a bit over a century ago. Electron lenses are limited by intrinsic aberrations to relatively small numerical aperture, so electron microscope resolution initially improved by increasing the beam voltage in order to reduce the electron wavelength. Unfortunately, higher energy electron beams are also able to knock atoms around more effectively, so by the late 1980's that strategy had more or less played out. Ways to correct lens aberrations in principle had been known since 1948. It was not until the 1990's that computer control of the microscope and the machining had developed to a point that these correction strategies became practical. The resulting geometric and chromatic aberration correctors rely on using a complex and rapidly expanding multipole expansion that requires a commensurate and increasingly large number of multipole lenses to correct successively higher order (and non-converging) terms in the aberration function. From 1996 to 2008, aberration correctors saw rapid improvements in resolution, reaching 0.5 Angstrom resolution in 2008, with only incremental improvements since then. So what has changed? While the corrector technology is mature and stable today, a revolution is happening in detector design. Direct electron detectors, with their better sensitivity and speed compared to the older generation of scintillators-coupled CCD cameras have already revolutionized biological cryo-electron microscopy. These detectors were designed for recording images with very many pixels, but very few electrons per pixel – perfect for low-dose biological imaging, but very poorly suited to higher-resolution materials applications where larger doses are used and needed. Further, most materials work is nowadays done with a small, focused beam, and the detector is placed in the diffraction plane, where the usable scattered signal varies in intensity by about 6 orders of magnitude. A little over a decade ago, Sol Gruner and I set out to develop a detector optimized for materials science work. We wanted a universal detector, that could collect the full distribution of scattered electrons, from which we could reconstruct any elastic imaging mode. This would also let us image grain orientation, strain, electric and magnetic fields. None of these are new ideas, but the detector technology had generally lagged well behind the dream, and not been widely adopted. A few die hards had persisted and developed a good theoretical basis that indicated what could be possible. Our first detector, adopted from a direct x-ray detector was promising - it had the speed and sensitivity, but lacked the dynamic range we wanted. From those lessons, we were ready to try again. By 2015, our electron microscope pixel array detector (EMPAD) was mounted on an old microscope and my graduate student Kayla Nguyen was taking very impressive diffraction data, showing polarization maps, as well electric and magnetic fields. In early 2016 we felt confident enough to move the detector to a state-of-the-art aberration-corrected tool, and started to get good results imaging 2D materials, recording the full diffraction pattern at every position in an atomically-resolved scan, allowing us to build up a 4-dimensional position-momentum phase space. The data was sufficiently encouraging to revisit an old technique, ptychography, that was designed to take advantage of all this extra data. Originally conceived as a way to solve the phase problem in crystallography, it exploits the phase information encoded in the diffraction pattern from a localized electron beam. Some more alert readers might now be wondering what has happened to the uncertainty principle if we are measuring momentum distributions from a small electron beam. If I had a parallel electron beam, the diffraction pattern would be a series of isolated diffraction spots. By focusing the beam to a spot of width dx, the diffraction spots will blur out into disks of width dk, with the product dx dk fixed as expected. When dx is made smaller than the atomic lattice spacing, then the diffraction disks become wide enough to overlap, and the interference between the wave functions from two adjacent scattered disks is captured in the overlap region. Moving the probe in real space, causes a phase shift in diffraction space, leading to a contrast change in the overlap. Ptychography or "folded writing" seeks to recover the phase shifts, and by stepping out from disk to disk can build up the phase relationship between all the scattered beams, thus solving the crystal structure. John Rodenburg extended the theory to apply to general, non-crystalline objects, recognizing this was also a way to extend the resolution of the electron microscope well beyond the limits of the lens. With his student Peter Nellist, they demonstrated a proof of concept for a thin silicon sample almost 25 years ago. At the time, electron detector technology was really too primitive to do much more, and the arrival of aberration correctors provided a powerful alternative. Instead, the x-ray community, which also had its own challenges with producing high resolution lenses adopted these ideas. The weaker interactions of the x-ray beam with the sample, and the less severe drift requirements at much lower resolutions of synchrotrons made it a more tractable implementation, and it is widely used there today. The rebirth of electron ptychography has benefited from both the new generation of detectors, and also the perfect samples in the form of 2D materials systems. Even with a limited dynamic range detector, ptychography shows dose advantages and light element sensitivity over other electron imaging methods, and in the past few years interest has picked up again. Now electron beams can be quite damaging, especially at higher energies, so much of the imaging of 2D materials is done at lower beam voltages, where the resolution is also quite a bit lower. Here is where the combination of our new high-dynamic range detector and ptychography come into play. By collecting the momentum distribution out to scattering angles well beyond the numerical aperture of the lens - i.e outside the central disk - we are able to recover more phase information than from the lens alone. In effect, we have created a virtual aperture that is larger than what could be achieved with the lens. Provided we can collect enough signal, we can increase the resolution commensurately. As a practical matter, we were able to boost resolution about 2.5x over what the lens alone could do. The question then becomes how to measure this improvement in resolution. After all, these are all distances smaller than a bond length, and microscopists really like to test resolution in real space, by bringing two objects closer together and seeing when they merge into a single object. Surprisingly, 2D materials provided us with the perfect test sample - a twisted bilayer. We stacked two monolayer sheets of molybdenum disulfide on top of each other, with the two sheets rotated a few degrees apart from each other. The resulting incommensurate moire pattern when viewed in project provides a range of atomic distance from a full bond length apart, to directly overlapping, with all possible spacings in between. This is essentially the world's smallest ruler, and following the patterns as the atoms shift in and out of registry lets us find where pairs of atoms are no longer resolvable, thus determining the resolution. 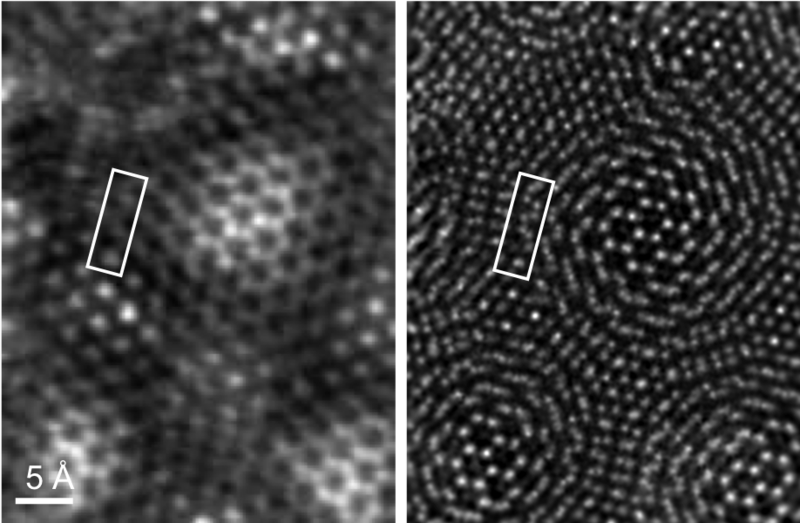 The figure below shows a comparison of the conventional annular dark field imaging mode on the left, with the ptychographic reconstruction on the right for the twisted bilayer. The two images are reconstructed from the same data set, so they are at the same recorded dose and instrument settings. Needless to say, for almost all of our 2D lattice imaging we have since switched to ptychography. There are still many opportunities to be had and challenges to overcome, especially in the imaging of thicker samples, but with the new generation of detectors and modern computers the earlier promises of ptychography are starting to be fulfilled. 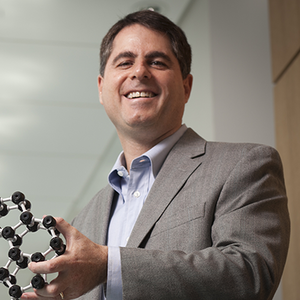 David Muller is the Samuel B. Eckert Professor of Engineering in the School of Applied and Engineering Physics at Cornell University, and the co-director of the Kavli Institute at Cornell for Nanoscale Science. His current research interests include the atomic-scale characterization and control of matter for applications in energy storage and conversion, exploring new phases of two-dimensional materials that cannot exist in the bulk, and developing a new generation of probability-current detectors and algorithms for measuring physical properties in an electron microscope.